If you're ever struggling for something to cook for Sunday lunch, and you eat pork, this is the Daddy of Sunday Roasts. It's gorgeous. The only problem is that it takes a little bit of planning. The recipe is in Nigella's Kitchen, on page 465. Pork belly is still one of the cheaper cuts of meat out there, so if I can't get to my butcher I buy two pork belly joints from the supermarket and cook both. This means you'll have lots left over for dropping into noodle soups, filling sandwiches, chucking into stir fries﻿ and picking from the fridge (come on, we all do it, even if we don't all do it in a red satin dressing gown like Nigella). The reason I say it needs planning is only this: you get the pork out of the fridge and marinate it in a mixture of tahini (you can pick this up from larger supermarkets now), soy sauce and the juice of one lemon and one lime. Cover with cling film and leave it for a few hours on the kitchen worktop if it's cool, or longer in the fridge if it's not - and then you just basically bung it in the oven and forget about it for three and a half hours. When it's cooked the meat will be invitingly succulent, tender and full of flavour. 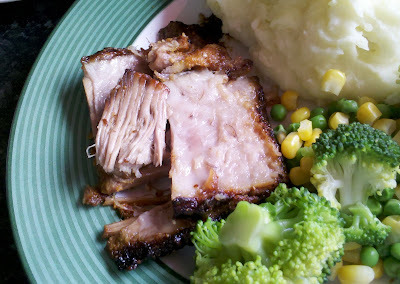 For those who are squeamish or worried about how fatty a cut pork belly is - don't. The fat renders away during the long, slow cooking and the meat stays moist in the centre and the crackling crisp. Nigella suggests serving this with noodles or rice, but we usually have it with mashed potatoes. And I have to agree that with pork belly you don't really need roast potatoes, but as she says "I like to provide what makes people happy". And I also like to use the crispy bits stuck to the foil after cooking to make a gravy. Just stir the meat juices that have collected, including the caramelised meaty bits (not the fat though) into a saucepan, with a little cornflour and dribble in some stock - I usually use beef stock - and cook gently, until it thickens. 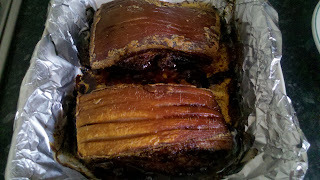 Just one word of caution though - do line your roasting tin with some foil when you put the pork into the oven. I wouldn't even want to think about the washing up cooking this for more than three hours generates. The photo below will give you some idea. This is one of the recipes we make over and over again and we all love it. If you're ever stuck for inspiration then give this great, tasty and economical cut a go. Do you have any other pork belly recipes? Have you made this one? Let me know in the comments below! I'm cooking this tomorrow night - some useful tips - thank you for the foil recommendation!! That's ok - hope you enjoy it! We have it religiously now about once a month! And it's cheap too :) Enjoy!